Does Teeth Whitening Gum Really Work? Beauty is only skin deep, but that doesn’t mean that you shouldn’t pay attention to your appearance. Making a great first impression often starts with an attractive smile — and the whiter your teeth are, the better. If you’re just now thinking about how to get a brighter set of pearly whites, you might be wondering which products are best for your purposes. Chewing gums that claim to whiten teeth could seem too good to be true; after all, it can’t be that easy, can it? Many whitening gums are slightly abrasive, which supposedly enables them gently remove surface stains from tooth enamel. Other gums contain ingredients that are supposed to prevent new stains from sticking. In truth, though, you should only buy whitening gum if you enjoy chewing gum and you like the taste of a particular product. There is extremely little research into the efficacy of these items when it comes to battling stains on teeth. Furthermore, you should always scrutinize the labels of the products you buy. You’ll find that some of these gums have fine print about how often you’re supposed to chew in order to see results. 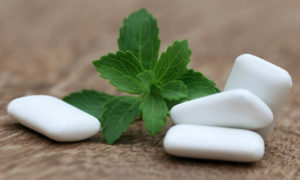 You might have to use the gum for an hour every day, and even then you may not see results until after you’ve been using it for three months or so — if you see any results at all, that is. What About Other Whitening Products? Now that we’ve been disillusioned about teeth whitening gum, let’s take a moment to consider other over the counter whitening products. Whitening toothpastes can be effective. However, they only tackle surface stains. OTC whitening strips can certainly give you a brighter smile, but they could make your teeth very sensitive or irritate your gums. At-home natural remedies, like oil pulling, usually have very little effectiveness for whitening teeth. If you’re serious about achieving a smile that sparkles, the best thing to do is team up with your dentist. In as little as one hour, your teeth can go from dull to dazzling. This is thanks to the innovative Zoom! whitening system, which uses a bleaching gel along with a special light to break up stains that are below the surface of your teeth. Your new look could last for years after your treatment! Your dentist may also offer take-home whitening kits that produce the same dramatic results in as little as two weeks. It’s true that professional whitening costs more than its OTC counterparts, but many people have found that the cost is well worth it because the process is quick, safe for the teeth and gums, and extremely effective. Whitening gum might taste yummy, but that is about its only significant merit. If you want a whiter smile, skip the chewing and head to your dentist for a professional treatment. Dr. Howard D. Brooks leads the team at Brooks Dental. As cosmetic specialists, they are eager to help their patients achieve teeth that are as gorgeous as they are healthy. If you have questions about professional whitening, please contact us at 617-846-1811. Comments Off on Does Teeth Whitening Gum Really Work?